Tochigi"- Little Kyoto" SUBPAGE | All Japan Kyoto Association"
Tochigi City is located in the southern part of Tochigi Prefecture with Mt. Tsukuba to the east, Mt. Ohira to the west and the Nikko mountain range to the north as well as the Uzuma River running through the city center. Since the city was located on the old Nikko Reiheishi Highway during the Edo period, it was an important lodging city for travelers. The area also flourished as a merchant town as the Uzuma River was a main transportation hub in those days. 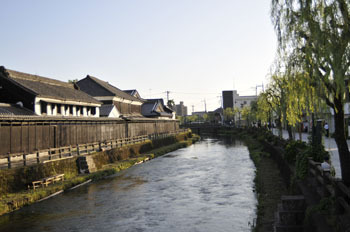 A number of storehouses were built and Tochigi became a town of politics, commerce and culture. The atmosphere of olden days still remains today. Old storehouses, white earthen walls of the houses, canals with colorful koi carp elegantly swimming by, along with many other attractions, such as the seasonal colors of Mt. 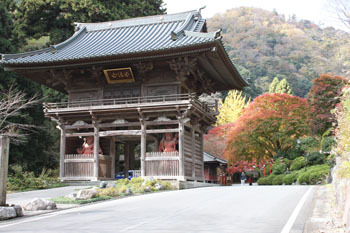 Ohira and the historical heritage of Izurusan Mangan-ji Temple, welcome visitors throughout the year. Both Tobu Railways and JR trains are available. The Express on the Tobu Railways runs almost every hour to Tochigi. By JR, depart from Ueno or Shinjuku Station to Oyama Station by the Express train, then change to the local train on the Ryomo Line. There is also an Express train which directly connects Tochigi and Shinjuku. Please note that there are two main stations in the city: one is Tochigi Station where both JR and Tobu Railways are available and the other is Shin Tochigi Station where only Tobu Railways provides services. The Tohoku Highway runs through the city from north to the south on which two interchanges are located: Sano Fujioka I.C. and Tochigi I.C. In 2011, a new Kita Kanto Highway which runs from east to west was opened with the Tsuga I.C. in the city. The Prefectural Road #50 connects the city with Gunma, Tochigi and Ibaraki prefectures as well as the national road #293 in the north part of the city. Since the city was located on the old Nikko Reiheishi Highway during the Edo period, it was an important lodging city for travelers. The area also flourished as a merchant town as the Uzuma River was a main transportation hub in those days. The Reiheishi Highway was the road ran all the way from Kyoto to Nikko. Many daimyo lords from western Japan traveled along the highway in order to visit the famous Nikko Tosho-gu Shrine and stopped by in Tochigi. The city’s main street such as Kauemoncho Street used to be a part of the highway. Classical storehouses still stand along the way reminding us of the city’s prosperity in those days. On the Uzuma River, a traditional boat ride has been recreated and visitors can enjoy a nice boat trip every day. Mt. Ohira (345 meters high), located on the west side of the city, is a fine mountain belonging to Mt. Ohira Natural Park. It is a nice recreation site for people who wish to enjoy the fullness of natural beauty throughout the year along with historical sites including Ohirasan Shrine. There are two recommended routes for visiting Mt. Ohira. One is the Omotesando Course (on Ajisai-saka Road) which takes a bus from Tochigi Station to Mt. Ohira. The other is a course going around the mountain on the trail. For those who wish to enjoy a full hike, the course from Mt. Ohira to Mt. Iwafune is recommended. How this mountain was named is unknown but some say that the mountain looks like a Japanese pouch (kinchaku) giving rise to its name. Another story recounts that the name came from the fabulous view of fully blooming azalea from spring to early summer. On the top of this little hill (only 80 meters high) stands Gokoku Shrine, established in 1879 by the first governor of the prefecture, Teikan Nabeshima, to enshrine the spirit of the war dead from Tochigi City and Shimotsuga County. The lantern was built to commemorate Japan’s victory in the Japan-Russia War. There also stands a memorial monument for Kennosuke Nishiyama, an activist at the end of the Edo period, as well as a bust of Mayor Onezawa, who made a wise decision about the maintenance of the Akatsu River. Kinchaku-yama pottery is produced in this area. Some of the works are exhibited in the Tochigi City Folk Museum. Access A 15-min. by the Kanto Bus bound for “Kokugakuin via Yamatocho” from Tochigi Station and get off at Kokugakuin-mae Stop, or a 15-min. by car from Tochigi I.C. One of the best but lesser known cherry blossom viewing sites in Tochigi is along the Nagano River, near the intersection where the Tohoku Highway and Nagano River meet. 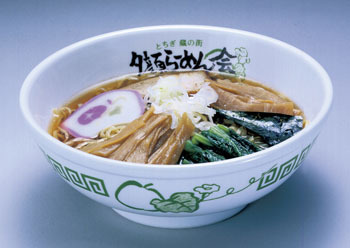 The Miyamachi area produces “Miya-negi” a green onion which is one of the traditional vegetables of Tochigi. Miya-negi is thicker and shorter than general Japanese green onions and is harvested only from the clayish soil in this area. It tastes sweet and soft. Access A 10-min. by car from Tochigi I.C. On the east side of Izuru and Mt. Mitsumine (aka Mt. Nabeyama) is an area called Hoshino. In Hoshino, there are recreated ancient pit houses from the Jomon period and a geological stratum museum where visitors can learn about the history and geography of the area. Japanese winter sweet, Setsubun-so (a kind of buttercup), fawn lily and many other lovely seasonal plants welcome people in every season. Handmade soba noodles, local dishes using wild plants and ancient tea will be available. Access A 20-min. by car from Tochigi I.C. Izuru is an area located in the forest on the northwestern end of Tochigi City. Izurusan Mangan-ji Temple, Izuru Fureai Forest, Izuru Soba buckwheat noodles and many other attractions entertain visitors throughout the year. There are some accommodations in the area which serve shojin Zen vegetarian dishes and local cuisine. Access A 25-min. by car from Tochigi I.C. Going out of the city to the west along the Prefectural Road Kisano Line and crossing a bridge over the Nagano River, one comes to the approach to Togu Shrine on the right-hand side. Continue along the road toward the right to the site of Minagawa Castle while Kongo-ji Temple is straight on. Minagawa Castle site served as the residence of the Minagawa Family who governed this area and established the city. Kongo-ji Temple was their family temple and Togu Shrine enshrines their guardian deity. Head back to the main road and go to the west next. With Minagawa Junior High School on the right-hand side, one will find a road turning to the right which leads to Kashiwagura. Follow this road and turn to the right at the corner to reach Kashiwagura Hot Spring at the end of the road. The eastern part of Minagawa region is called Fukiage, where Mt. 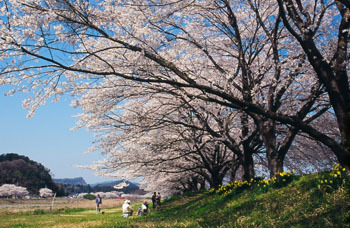 Ibuki and Shimejigahara Field are located , both of which were already very famous in the Heian period. Access A 15-min. by car from Tochigi I.C. Turn to the east at the Imai By-pass on the Prefectural Road #2, continue along the road, and one will see a large sign for Omiwa Shrine on the right hand side. Turn to the right at this sign and a forest of old big cedar trees will be right in front. This is the precinct of Omiwa Shrine. Before the reorganization in 1957, the area was an independent village named Kou Village which was the center of the region and had a government tax office. Researchers excavated the site to the south of Omiwa Shrine and discovered the remains of the old tax office. 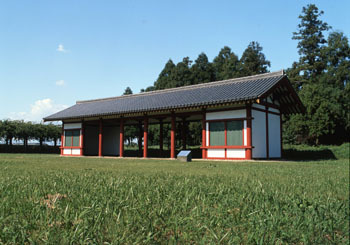 The shrine hall was recreated on the south side of the Miyanobe Shrine based on the excavation. Going to the east on the Prefectural Road Tochigi Ninomiya Line and crossing Daikoji Bridge over Omoi River reaches the former Kokubunji Town (present-day Shimotsuke City) where many historical sites including Shimotsuke Kokubun-ji Temple and Kokubunni-ji Temple are located. 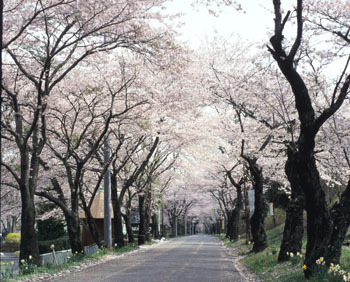 Some 4,000 cherry trees on both sides of the road create a stunning cherry blossom tunnel in spring. The Nagano River runs on the west side of Mt. Kinchaku. Cross Jonin Bridge and turn to the right, and there is the start of a nice walking path. In the early 20th century, Japan experienced a terrible economic recession and a number of people lost their jobs. At that time, the mayor of the town, Choshichi Hasegawa, decided to launch a big project in order to assist those people. It was to construct a new long walking path. After t he construction from 1932 to 1934, the 4-km path was completed and it was donated to the city by Tobu Railways. 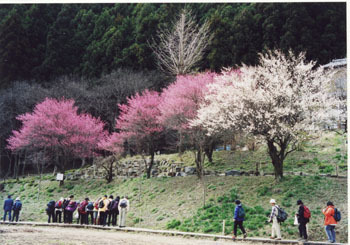 Later, seedlings of cherry tree were planted along the path which have become a beautiful cherry promenade today. 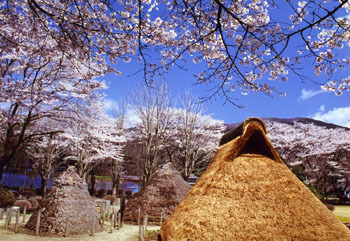 Hoshino Nature Village is blessed with many historical and natural attractions. One of the highlights is the period when a large group of fawn lilies bloom all together from late March to early April. Other wild flowers and plants entertain people in every season. The fine panoramic view of Hoshino Town from the top of Mt. Bonten (400 meters) is breathtaking. Handmade soba buckwheat noodles and local cuisines using seasonal wild plants are a must-try. 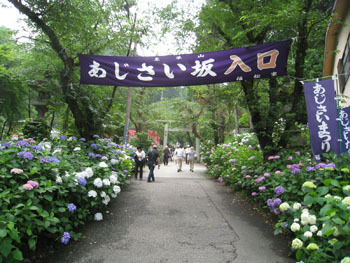 The approach of Ohirasan Shrine, between the Rokkaku-do hall of Mt. Ohira and Zuishin-mon Gate, consists of about 1,000 stone steps along which some 2,500 shrubs of several kinds of hydrangeas grow. The hydrangeas were donated by Lions Club members in 1974. The best time to enjoy them is from late June to early July. The stones used for the steps are mined from the area. Constructing such a long flight of stone steps with large rocks required tremendous effort by the worshippers who built it. The black rocks shine beautifully on a rainy day. Enjoy a leisurely walk for about 30 minutes while being entertained by the vibrant colors of hydrangeas. The 108 Lantern Sending-off is a traditional ritual designated as an Intangible Folk Cultural Property by Tochigi City. It started in the early Meiji period (19th century) as a ritual related to the Funazenjo rite at Nikko Futarasan Shrine in order to pray for the safety of boats traveling on the Uzuma River and to get rid of 108 worldly desires on to the river. 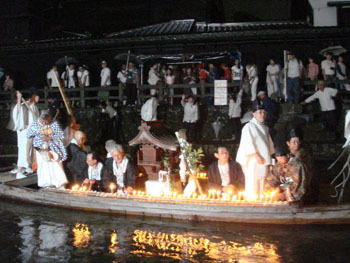 Boatmen dressed in sacred white costumes row a boat carrying a spirit of the deity on the river and light 108 candles. Some say sending off 108 candles on to the river can get rid of worldly desires and others say that the 108 candles are good symbols for a safe child delivery. Tochigi used to produce a lot of geta (Japanese wooden clogs) and is counted as Japan’s three best geta production areas along with Fukuyama in Hiroshima and Shizuoka. Materials used for the clogs are Yashu-kiri and Aizu-kiri (both a kind of paulownia tree) both of which are found in the northern Kanto area. 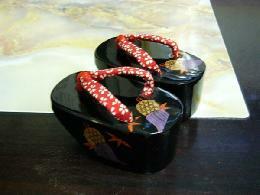 Geta clogs made in Tochigi were very famous and have been recognized since the Edo period for their superb quality. Geta clogs are not generally worn today but the traditional technique of geta making still survives in the making of mini-geta clogs which are a popular souvenir. They are also called Kura-geta (with a wish for business success) or Chikara-geta (as people believed that letting a baby wear these mini clogs make the baby’s legs strong). Probably, a combination of fried noodles and potato doesn’t sound good, however, once you taste it, you will surely change your mind. 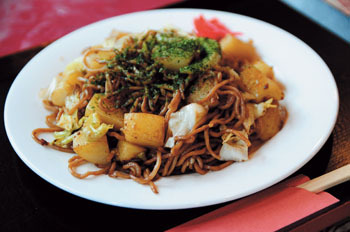 For the local people of Tochigi, fried noodles cannot be eaten without potato and the dish has been loved for many decades. It is said that people invented this noodle dish during the war time; because of a lack of food, people added potato to the noodles to increase the quantity. This is a must-try special dish of Tochigi. Yugao is a kind of vegetable. In Japan, rolled sushi contains a vegetable called kanpyo and the kanpyo is made from yugao which looks like a round gourd. Tochigi is a production area of kanpyo. Since kanpyo is used almost only for sushi, local people wondered if they can use kanpyo in other dishes. This is how “Yugao Ramen” was born. The noodles are made from flour mixed with powdered yugao. The noodles have a soft and smooth texture and are very good for health as they contain lots of fiber and calcium. In the old days, people believed that hens which chattered at night invited bad luck and brought such hens to Mt. Ohira to dedicate them to the deity of the mountain. Then, people collected their eggs, fried them and used the hen’s meat to prepare yakitori (grilled chicken on skewers) to offer to the deity of Ohirasan Shrine. 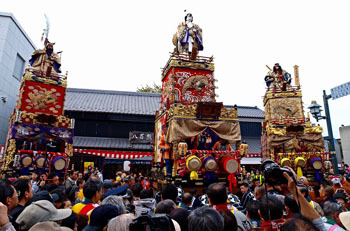 Ample amounts of rice and grains were also offered as people wished for a good harvest in autumn. They produced “Ohira Dango” - sweet dumplings, using the rice. There are many restaurants and stalls in the area near Mt. Ohira and Mt. Kinchaku which serve the “Three Must-try Specialties of Mt. Ohira (yakitori, sweet dumplings, and fried egg).” Try and enjoy the taste of Tochigi.